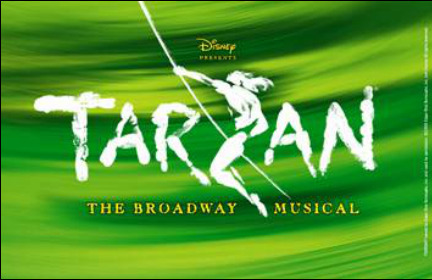 Disney’s “Tarzan” swings to the stage in a four day engagement at Green Hope High School! under the direction of Mr. James Gorski, the technical direction of Mr. Don Carreras, and student direction of Sarah Hooper. NOTE: ​The Sunday, 3/19 3 PM performance of Tarzan is almost at capacity. A limited number of tickets will be available at the door starting at 2 PM. All tickets for Tarzan are reserved/assigned seating. For this production, Rows A and B in Sections 1 and 4 are unavailable. If you need a Wheelchair seat, please email tickets@greenhopefinearts.org for purchase instructions. Wheelchair spaces are at the end of Rows A, G, H and O. We are delighted to welcome you to Tarzan's jungle kingdom this Thursday through Sunday! Please be sure to print and bring along a ticket for each person in your reservation. Not sure how to print your tickets, click here for instructions. Misplaced your order, click here to look it up. Click the image below to view the Tarzan Production Calendar. Note: Calendar subject to change. Please ask a teacher if you are not on the Remind 101 distribution list. Questions: Contact Ms. Poppe or the FAB VP for Drama/Theatre. For questions about ticket purchases, click here.